Merit Medical’s senior leadership team accepting Company of the Year award from Rachel Shelly, head of Medical Technologies, IDA Ireland. 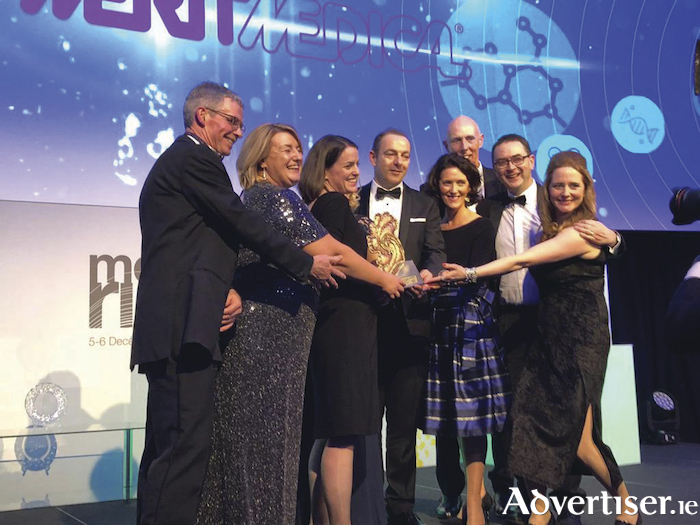 Galway-headquartered Merit Medical Ireland won the Medtech Company of the Year Award 2018, a prestigious award granted by a panel consisting of Irish business enterprise and governmental agency leaders, at an awards ceremony held awards in Cork last week. Merit Medical Ireland commenced operations in Castlerea, Co Roscommon, Ireland in 1993 with 22 employees manufacturing single-use inflation and hemostasis devices. Today, Merit’s European operations are headquartered in Galway City, Ireland, with approximately 1,000 employees. Merit now has two state-of-the-art facilities (157,000 square feet ) in Galway and supports operations and R&D activities for Merit’s additional European facilities in Roissy, France and Maastricht and Venlo, The Netherlands. Merit’s European operations contributed approximately 33% to Merit’s corporate revenues in 2017 and Merit’s Galway facility is a recognized centre of excellence. In the last four years, revenues from Merit’s European operations have increased by 74% with matching employee growth, while continuing to execute on margins above Merit’s corporate average. Founded in 1987, Merit Medical Systems, Inc. is engaged in the development, manufacture and distribution of proprietary disposable medical devices used in interventional, diagnostic and therapeutic procedures, particularly in cardiology, radiology, oncology, critical care and endoscopy. Merit serves client hospitals worldwide with a domestic and international sales force and clinical support team totalling in excess of 300 individuals. Merit employs approximately 5,600 people worldwide with facilities in South Jordan, Utah; Pearland, Texas; Richmond, Virginia; Malvern, Pennsylvania; Rockland, Massachusetts; San Jose and Aliso Viejo, California; Maastricht and Venlo, The Netherlands; Paris, France; Galway, Ireland; Beijing, China; Tijuana, Mexico; Joinville, Brazil; Markham, Ontario, Canada; Melbourne, Australia; Tokyo, Japan; and Singapore. Page generated in 0.2320 seconds.